A Dog Crate That Meets IATA Standards. I fly my dog around the world. Between finding an affordable flight, organizing vet appointments and sifting through import paperwork, the last thing I want to worry about is if my dog crate is allowed or not. Some airlines are stricter than others. I bought a dog crate with all the bells and whistles that meets the requirements of every airline I have come across. You can check the IATA standards for dog crates here. I bought a sky kennel, and I am very satisfied with it. I cannot stress enough how important this is. Every airline is different, but Icelandair’s cargo division attaches the health certificate to the dog’s crate. Upon arrival in Paris, Zala’s health certificate was no longer attached to the crate. Although technically only the original can get your dog into the country, I thankfully had a copy and got my dog’s clearance to enter France. Don’t put your $100 orthopedic dog bed in the your dog’s crate. After a 10-15 hour flight, you can’t blame a dog for getting bored or frustrated and chewing up their bed. If your dog has an accident, you want a dog bed you will have no hard feelings about throwing away. I have never had either of these incidents occur with my dog, yet. It is best to be prepared. I keep Zala’s Ruffwear Highlands Bed in my carry on luggage as a spare, just in case. A collapsible water bowl is a good thing to keep on hand. Some airlines allow water dishes inside of your dogs crate, but you have no way of knowing if it will survive the flight. Zala destroyed one of her two dog dishes on her trip from Seattle to Paris. As soon as my dog gets out of customs, I pour her a drink. Usually our journey continues by train or a connecting flight so Zala has to recharge on the go. A collapsible bowl takes up very little space in my carry on luggage, and I can smash it into any pocket in my pack while I am hustling to catch my next train or flight. I carry a Ruffwear Collapsible Bowl everywhere I travel with my dog including restaurants, cafes, trains, car trips, and any hiking adventure. I never go to an airport with my dog in her crate. I keep her leashed and by my side until the moment I turn her over to oversized luggage. Get a leash with a loop handle to easily half hitch around a chair leg. A simple hack for easy tie up is to use a carabiner for fast clip and unclip. Zala and I have spent a lot of time lounging within and outside of terminals. Small dogs get a get out of jail free card on this topic, but big dogs should wear a muzzle inside airports and on public transportation. Big dogs scare a lot of people, and I believe I am able to walk Zala freely throughout airports because I muzzle her. This isn’t to say that when we find a nice place to sit I don’t take off her muzzle because I do. I simply don’t put security guards and officers in a position where they need to tell me to crate my dog. I don’t want to give the public a reason to file a complaint because this will only create more rules and restrictions for future pet travel. I use a simple mesh muzzle that slips on and off easily and can be crumpled in my pocket. Be careful, this style of muzzle does not allow a dog to pant and can cause overheating in hot climates. Invest in a basket cage muzzle if your dog will be wearing a muzzle for long periods of time or in hot climates. If possible, pack enough dog food to mix and smoothly transition your dog into a new brand in your future country. It can be difficult to consistently use the same brand throughout the world. The one dog food brand I have seen consistently from the United States to Western Europe to Southeast Asia is Pedigree. It may not seem important to you but in a dog’s world this is a big deal. A favorite toy from home has a calming effect on dog’s adjusting to a new home/country. Zala has taken her Extreme Kong across the world with her. It is the equivalent of a pacifier when she is anxious. I am a big fan of Kongs because they can be stuffed with goodies while you are away and provide some mental stimulation for your dog. I’ve even freezed things inside of it. 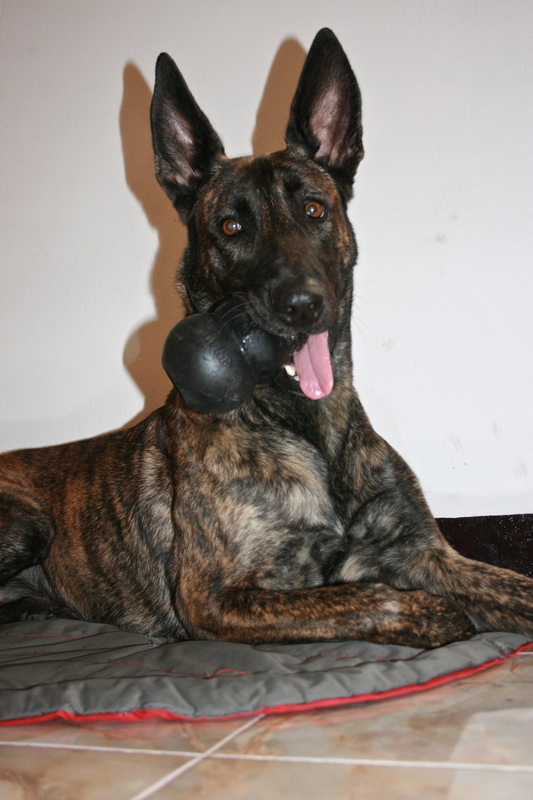 Zala has been obsessively chewing on her black kong on a daily basis for two years, and it is still in one piece. I wish I could bring my little dog Barney with me when I travel somewhere, but unfortunately he has some serious mental health disorders and I simply can not. That’s why I don’t travel, I can’t leave him and I can’t take him with me either. Do you have some good experience with dog boarding? I live in Vancouver and I can’t choose the right one. I really miss travelling but I would miss Barney more if something happened to him. Hello! Thank you for your articles they are making me less anxious about travelling with my two small pets 17lbs each. How was your experience for icelandair? Would you recommend them. I am travelling using icelandair for myself and two dogs in january and the closer the date comes the more nervous I am.